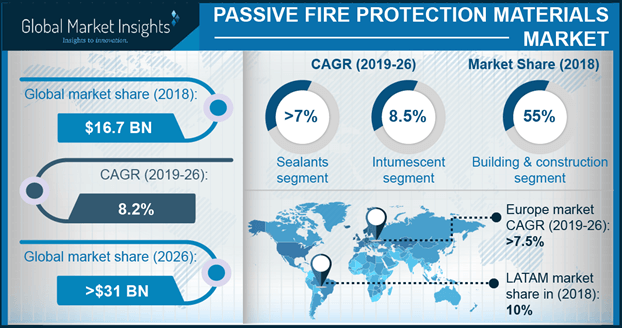 Passive fire protection materials market has garnered much limelight lately than ever in the recent times courtesy - an alarming increase in the number of fire accidents across the globe. Events such as the tragic Grenfell Tower fire in London last year have apparently underlined the significance of enhancing the existing fire safety standards and the imminent need to install efficient and effective fire protection materials in the commercial and residential buildings. Moreover, as a consequence of the aforementioned causes, it has been observed that an increasing number of government agencies have been framing stringent regulatory norms pertaining to the extensive deployment of fire protection materials, which would eventually boost the morale of leading passive fire protection materials industry players. As claimed by Global Market Insights, Inc., the overall passive fire protection materials market space was pegged at over USD 13 billion in the year 2016 and is likely to witness an impressive CAGR of around 8.7 percent during the estimated time frame. While elaborating further upon the prospective growth of passive fire protection materials industry, it would be quite prudent to mention that a host of research institutions and universities have been striving hard to develop alternatives to chemical fire retardants, given that the current scenario has understandably necessitated the installation of sustainable and environment-friendly fire protection materials. Apparently, a number of research scholars and scientists are applying their expertise to refine the existing fire protection materials that would invariably limit the impact of existent drawbacks, which include higher costs of raw materials and complex installation procedures, that have hampered the growth prospects of the overall passive fire protection materials market in the past few years. To cite an instance of the renewed enthusiasm that is being observed in the research fraternity, scientists from Singapore’s foremost autonomous institution, Nanyang Technological University (NTU), recently announced that they have invented a new corrosion-resistant coating named as Firoshield. The latest coating costs around half as much as conventional coatings and can be applied to structural materials such as timber, steel, and concrete in half the time currently being taken to apply conventional products. Moreover, Firoshield, which has been reportedly developed in collaboration with engineers from Singapore’s industrial developer JTC Corporation, is being termed as remarkable by passive fire protection materials industry experts, given the unique properties of the latest coating. Apparently, it goes without saying that such proactive measures to develop improved forms of fire protection materials would eventually impel the growth potential of the global passive fire protection materials industry. Owing to the rapid pace of urbanization and industrialization across the world, building and construction industry is set to grow at an exceptional pace, which would, in turn, boost the growth prospects of passive fire protection materials market space. Citing an instance to highlight the importance of this end-user industry, the Association for Specialist Fire Protection (ASFP) has reportedly endorsed the interim finding of the Independent Review of Building Regulations and Fire Safety, an investigative committee which was set up to examine the causes that led to the massive fire in Grenfell Tower, London. Furthermore, it is to be noted that the AFSP has long been mandating third-party certification of fire protection materials installers and products as well. The committee has recommended that the overall building and construction industry in the UK needs a significant reform to prevent fatal accidents caused due to fire in the risk-prone surroundings. Industry experts affirm that the aforementioned recommendation readily applies to the worldwide construction sector and further claim that the overall passive fire protection materials market would benefit immensely if such recommendations materialize in the immediate future. In fact, the Asia Pacific building and construction industry, regarded as one of the most prominent end-user verticals of the global passive fire protection materials market, is estimated to register a CAGR in excess of 7 percent over the next seven years. Needless to mention that the rising emphasis on safety standards by regulators in various nations would undoubtedly fuel the passive fire protection materials industry progression in the ensuing years. Concurrently, the recent spurt in R&D activities to enhance the fire-resistant products segment has compelled several end-user industries, including oil and gas, transportation, manufacturing, and warehousing, to massively install these materials to prevent fire hazards. As per estimates, the global passive fire protection materials market share is forecast to surpass USD 27 billion by 2024.